Every Sunday morning, nursery care is provided during the 10:30 a.m. service for children from birth to 5 years old in the Children’s Nursery. The nursery is located down the hallway on the left. It opens at 9 a.m. and closes when the 10:30 a.m. service is over. 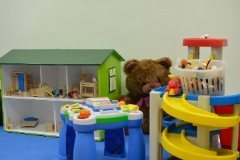 The nursery has lots of toys and books for the children to play with. Both nursery care providers, Mary Perman and Jill Baldwin, are long-term St. John’s members who have completed childcare training. Your child will be well looked after. When you drop your child off in the nursery, be sure to fill out the sign-in sheet with the child's name and age. If a baby or toddler needs a diaper change during the service, someone will come get you. The nursery care providers are not allowed to change diapers. You are welcome to visit the nursery before, during or after the service. Mary and Jill will be most happy to talk to you and answer any questions.